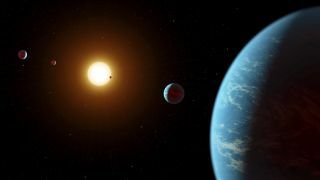 An artist's illustration of the K2-138 system, which contains at least five planets orbiting closely around their parent star. A family of four planets orbiting a distant star was discovered last April, with the help of citizen scientists around the world. In a new paper, researchers reveal some fascinating features of this alien solar system, including the presence of a fifth planet. The planetary system K2-138 is home to at least five "sub-Neptune" planets, meaning they are between the size of Earth and that of Neptune, according to the new study. The planets all orbit extremely close to their parent star, even closer than Mercury orbits the sun. K2-128 was discovered using data from the K2 mission, which has observed over 280,000 stars in three years, according to a statement from the California Institute of Technology. The mission utilizes the Kepler space telescope, which suffered a series of hardware failures and could no longer operate the way it was initially intended. The K2 mission allowed Kepler to continue operating in another way. Software programs can sort through the initial K2 data and select those stars that might be home to planets, but those programs aren't yet good enough to independently confirm the presence of a planet around a star in the K2 data. That leaves thousands of stars that need to be analyzed by the K2 scientists, which is far more than those researchers can handle in a reasonable amount of time, according to Jessie Christiansen, a K2 collaboration member and staff scientist at the California Institute of Technology (Caltech), who spoke at a news conference at the 231st meeting of the American Astronomical Society, in Washington, D.C. yesterday (Jan. 11). To try and sort through the K2 data faster, the mission scientists initiated a crowdsourcing project. In this effort, members of the public would be able to review the data that the K2 software had sifted out and help identify the systems that host planets. The result was the Exoplanet Explorers citizen scientist project, developed by Christiansen, along with Ian Crossfield, an astronomer at the University of California, Santa Cruz. The program was launched in April and hosted on Zooniverse, an online platform for crowdsourcing research. "People anywhere can log on and learn what real signals from exoplanets look like, and then look through actual data collected from the Kepler telescope to vote on whether or not to classify a given signal as a transit or just noise," said Christiansen. "We have each potential transit signal looked at by a minimum of 10 people, and each needs a minimum of 90 percent of 'yes' votes to be considered for further characterization." The Exoplanet Explorers program got a big boost in publicity two weeks after it launched, when it was featured on the Australia Broadcasting Company's television series "Stargazing Live," co-hosted by celebrity physicist Brian Cox, for three consecutive nights. Within 48 hours of the program's debut, more than 10,000 people had participated in Exoplanet Explorers and classified over 2 million systems, according to the statement. Following the first night of the program, the researchers watched the results roll in, as citizen scientists helped sift through the data. On the second night, enough people had participated that the researchers were able to share the demographics of the planet candidates that had already been flagged and were undergoing additional analysis: 44 Jupiter-size planets, 72 Neptune-size planets, 44 Earth-size planets and 53 sub-Neptunes (larger than Earth but smaller than Neptune). On the third night, the scientists announced the detection of the K2-128 system, although at the time they could identify only four planets around the star. The researchers said in the statement that K2-128 is the "first multiplanet system of exoplanets discovered entirely by crowdsourcing." An artist's concept of the K2-138 planets, showing their orbits and sizes, to scale. (The size of the parent star is not to scale). Some of the major findings reported in the new paper are the discovery of a fifth planet and hints of a possible sixth planet in the data. The star at the center of this system is slightly smaller and cooler than our sun. While the innermost planet might be rocky like Earth, the other four known planets are gaseous, like Neptune. All five planets orbit around the star with periods shorter than 13 days. (Mercury's orbit around the sun is 88 days.) That close proximity means the planets have temperatures ranging from 800 to 1800 degrees Fahrenheit (425 to 980 Celsius), so even the rocky planet is not habitable for life as we know it. All five of the confirmed planets, which are lettered a through e, orbit their star in resonance with each other, meaning the length of each planet's orbit is related to the next planet's orbit in the same way. More specifically, dividing the length of one planet's orbit by that of the next nearest planet produces nearly the same ratio each time: 3:2 or 1.5. In each case, the exact ratio of two orbital lengths is slightly higher or lower than 1.5, but by less than 0.1. The TRAPPIST-1 system, which contains seven planets orbiting very close to their star, also displays orbital resonances but the ratio does not work out to whole integers. Resonances with whole integers are called "fundamental" resonances. This planetary resonance indicates that the orbits of the planets are influencing each other and have probably been influencing each other for a long time, according to the statement. Some planetary-formation theories predict that these relatively large planets formed at locations farther away from their parent star than they are now, and the resonances indicate that they moved in toward the star together, in a relatively calm manner, Christiansen said at the news conference. "Some current theories suggest that planets form by a chaotic scattering of rock and gas and other material in the early stages of the planetary system's life. However, these theories are unlikely to result in such a closely packed, orderly system as K2-138," Christiansen said in the statement. "What's exciting is that we found this unusual system with the help of the general public." Konstantin Batygin, an assistant professor of planetary science at Caltech who was not involved with the study, agreed that the resonances of the five planets indicated a calm migration period, according to the statement. "Orbital commensurabilities among planets are fundamentally fragile, so the present-day configuration of the K2-138 planets clearly points to a rather gentle and laminar formation environment of these distant worlds," Batygin said.